This book, based on the author’s PhD thesis, examines the education of Luton girls and the relationship with employment opportunities. The acknowledged independence of spirit to be found in Luton was especially noticeable among its female population who enjoyed considerable economic power within the traditional hat-making industry. In spite of this, there is evidence to show that girls’ education was biased towards their roles as wives and mothers. However, by the early twentieth century, the effects of compulsory education and the introduction of new industries into the town meant that their status and expectations had changed. Sunday schooling was important to children from the labouring classes and the contribution of these schools has been assessed. Specific themes include half-time schooling and the granting of labour certificates which allowed children to leave school before the statutory age. The contribution of the home and independent organisations, the training of teachers, the character of rural schools and the introduction of technical and secondary education have also been considered. While emphasis is on the education of girls from the lower social classes, the middle classes have not been ignored. Dr Anne Allsopp was born in Luton and attended Luton High School for Girls. She taught in local schools before gaining an MA and PhD at the London Institute of Education. 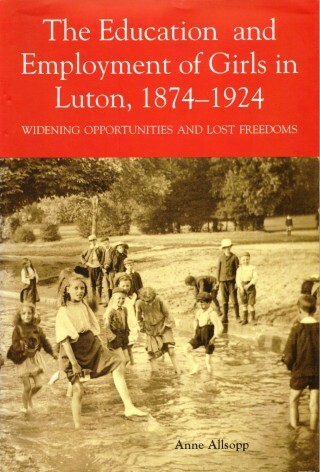 She has published a history of Luton and an account of Luton High School and the Technical School. Her particular historical interest is the lives of ordinary people. ‘Allsopp succeeds in putting scholarly detail on to the well-rehearsed discussion of the advancement of women’s education and the development of mass education in the last part of the nineteenth century. … Anyone beginning a similar local study would be well advised to follow the example set by Allsopp in her research.’ – Stephanie Spencer, History of Education, 2007, vol. 36, no 4/5, p. 643-5. The story ‘is told with great skill by a writer who pulls off the difficult trick of combining the meticulous approach of the academic with the skill of a storyteller enjoying her tale.’ – Gerald Haigh, Times Educational Supplement, 14 October 2005.